What is the difference between PIL, writs and petition? THIS IS A GREAT SERVICE TO THE VOTER……. .
You will get almost all details about the candidate like their education, criminal cases, total assets etc……. Click on a particular candidate and you will get more data than you can imagine !! Check this link before you go for voting..!! Very Interesting data that one can use !!! The Journal of the American Medical Association (JAMA) defines spin as the “specific reporting that could distort the interpretation of results and mislead readers.” Spin Doctors are, thus, the people falsifying data for reasons including financial ties to Big Pharma, to achieve higher professional status and to gain grant monies. One of the most dramatic effects of spin is seen in a recent study published by JAMA. Researchers reported that over 40 percent of the best designed, peer-reviewed scientific papers published in the world’s top medical journals misrepresented the actual findings of the research. To confirm this and to identify the nature and frequency of distorted presentation or spin, Boutron et al. systematically evaluated 616 published reports of Random Control Trials (RCTs) and after appraising the 72 eligible studies concluded that, “In the representative sample of RCT’s published in 2006 with statistically nonsignificant primary outcomes, the reporting and interpretation of findings was frequently inconsistent with the results.” In other words, most of the published research has been intentionally falsified. We found dark black hair-like structures sticking out of the nugget mass, as well as light blue egg-shaped structures with attached tail-like hairs or fibers. These are shown in extreme detail in the photos below, taken on August 15, 2013 at the Natural News Forensic Food Lab. The actual Chicken McNugget samples used in these photos have been frozen for storage of forensic evidence. We also found odd red coloring splotches in several locations, as well as a spherical green object that resembles algae. We are not claiming or implying that these objects in any way make McDonald’s Chicken McNuggets unsafe to consume. We do, however, believe that this visual evidence may warrant an FDA investigation into the ingredient composition of Chicken McNuggets. In particular, where are the hair-like structures coming from? This is especially important to answer, given that chickens do not have hair. Is there cross-species contamination in the processing of Chicken McNuggets? This question needs to be answered. Share this story with everyone you know. A Russian man who decided to write his own small print in a credit card contract has had his changes upheld in court. He’s now suing the country’s leading online bank for more than 24 million rubles ($727,000) in compensation. Disappointed by the terms of the unsolicited offer for a credit card from Tinkoff Credit Systems in 2008, a 42-year-old Dmitry Agarkov from the city of Voronezh decided to hand write his own credits terms. The trick was that Agarkov simply scanned the bank’s document and ‘amended’ the small print with his own terms. He opted for a 0 percent interest rate and no fees, adding that the customer “is not obliged to pay any fees and charges imposed by bank tariffs.” The bank, however, didn’t read ‘the amendments’, as it signed and certified the document, as well as sent the man a credit card. Under the agreement, the bank OK’d to provide unlimited credit, according to Agarkov’s lawyer Dmitry Mikhalevich talking to Kommersant daily. Click Here for the interesting story of beating the bank at their own game. Please follow this procedure strictly else your complaint will be rejected. We charge Rs 300 for sending a notice to the Opposite Party. This is non-refundable if your complaint gets rejected because you failed to follow the procedure given below or for any other reason. Your documents will not be returned as they are our property and we destroy them after use. 1) Pay Rs 300 by net banking and note the net banking transaction number. Please send a blank email to payment@consumergrievance.com to get net banking details within two minutes of sending request. Sometimes, but rarely, this mail may get delivered to your spam folder also. We prefer that you pay online. But if you do not have netbanking facility, you can also pay Rs 300 by demand draft or “AT PAR cheques” in favour of “ICRPC” payable at “Mumbai”. Write your name and cell number behind the cheque. You will get only one opportunity to fill this complaint form, so do not waste this opportunity by clicking submit button aimlessly. After submitting the form you will get a copy of this submitted form with complaint number to your email ID mentioned in the form. Sometimes it may also be delivered in your spam box. Take a printout of this email and use it as your cover letter. Your complaint number will be your reference number for all further queries. The printout of your email of the submitted form that you received after submitting the form. If not paid by netbanking, then attach with pin (do not staple) with the first page, your Rs. 300 demand draft or At Par cheque or local Mumbai account cheque. 5) E-mail of the chairman / company e-mail where notice is to be sent. Without this notice cannot be sent and your complaint will be rejected. 6) Bill details, item details of purchased product or service. 7) DEFECT: What is the defect in the product or service (write in short paragraph). It has to be very clear and focussed as we will not search your documents to discover your complaint. Do not be lazy by not writing explanation of defect paragraph and just pointing to the attachments. We will reject such complaint that do not explain the defect. 8) RELIEF: What relief you want or what justice you want. (example refund, replacement, compensation, etc). It has to be very clear with facts and figures. Attach Xerox copies of Documents (like bill, agreement, service report, your complaint letter to them, your notice to them, etc). Enclose only the xerox copies of supporting documents only. Don’t send originals as these will not be returned to you as they are shredded and destroyed after use. Please staple or tie with thread all your papers in one bunch only. Complaint with loose, unstapled, untied or in separate bunches will be rejected. We do not entertain complaint documents sent to us in installments, in different envelopes, or as loose papers. 1) We will acknowledge the receipt of your documents received by courier / post. Please do not disturb us for next 60 days by asking us whether we have received your documents or not, or to know the status of your complaint. We will also inform you within 60 days if your complaint is rejected. 2) We will issue a legal notice to the accused within 60 days of receiving your documents, giving him a time limit of 7 to 15 days for settling your grievance. We will send you a copy of this notice to your e-mail address mentioned in your complaint. If the complaint has been rejected due to not following the procedure, we will inform you within 60 days. 3) If you do not receive acknowledgement or copy of notice after completion of 60 days, please send a reminder e-mail to us at mail@consumergrievance.com writing your name, OP name and your complaint number. 4) If your grievance is not settled after sending notice, ICRPC will further help you with preparation of your case papers for filing in the consumer court. There will be a nominal fee for preparation of the case papers. After sending of the notice, please inform us about your intention of filing a case in the consumer court so that we send you the procedure for preparation of case papers. You will not require a lawyer as we will guide you till the final orders of the court. The judge in any consumer court cannot force you to hire a lawyer. Consumer case is filed in the city where the cause of action happened or where the Opposite Party has an office, branch, agent or presence. 1) We operate through the internet, e-mail, and cater to the consumers across the world. So, it does not matter where you are located as long as you have access to emails. 2) Please do not visit us. We do not meet anyone. All have been turned away from the door when they tried to visit us. 3) Repeat notice is never sent, as we want our single notice to be taken seriously. Therefore do not ask us to send notice once more. 4) Time limit for filing case in the consumer court is within 2 years from the date of cause of action. 5) After sending notice, if your matter does not get settled, you can file consumer case in the consumer court. We will help you in preparation of case papers. 6) There is a court fee charged by consumer court when you file a case papers in the consumer court. Details of fee are given on our website. 7) Consumer courts take about 1 to 2 years (or even more at times) to settle the case. The consumer is expected to attend the court hearings at least 3 to 4 times in a year. Consumer can also appoint an authorised representative / power of attorney to attend the court hearings on his behalf. Irrevocable blanket consent taken from flat buyers will not help builders who want to construct additional floors that were not mentioned in original plans at the time of sale, the Bombay high court (HC) has said. The HC upheld a civil court order restraining city-based builder Shah and Modi Developers from adding more floors to Swapnalok building in Malad. Advocate S C Naidu, counsel for the developer, said there was express consent given by the flat buyers at the time of purchase that no permission would be required from them if the developer wanted to make any additional construction and they would not raise any objection. The judge said that such a clause was “wholly inconsistent with and contrary to legislative mandate” of section 7 of the Maharashtra Ownership of Flats Act. The provision says that a builder has to take the consent of all flat buyers for making any alterations in or additions to the structure of the flats or of the building after plans and specifications are disclosed at the time of sale. Shah and Modi cited another clause in the agreement which mentioned that the developer can acquire additional construction rights in the form of TDR (transfer of development rights) to add floors. They also pointed to the foundation plan of the building, which showed that it was capable of bearing up to six floors. But the HC said this did not constitute express consent and the approved plan disclosed at the time of purchase was admittedly up to four floors. 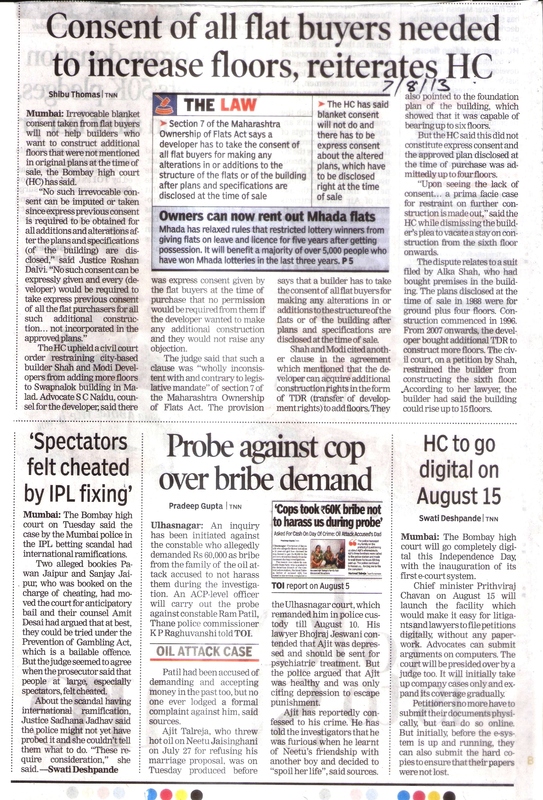 “Upon seeing the lack of consent… a prima facie case for restraint on further construction is made out,” said the HC while dismissing the builder’s plea to vacate a stay on construction from the sixth floor onwards.